With shades of pink abundantly present throughout Victor E. Court, the Northern Illinois volleyball team conquered Buffalo for the second time in as many years in a Breast Cancer Awareness match. The Huskies swept the Bulls, 25-20, 26-24, 25-19, on Saturday night just a few hours after the NIU football team nearly did the same to Buffalo’s football squad with a 45-14 homecoming triumph. The seventh win in a row for NIU improved the team to 21-2 on the season, and 7-1 in Mid-American Conference play. The Bulls, who fell to NIU in their Pink Match last season on the same weekend in Buffalo, N.Y., dropped to 14-10, 2-6 in league competition. Freshman outside hitter Lauren Wicinski (Geneva, Ill./Geneva) led the way for NIU with 21 kills, a .357 attack percentage, 10 digs, and a season-best five blocks. The nation’s freshmen kills leader has now totaled double digit putaways in 22 consecutive matches, including having 20 or more in the last four. The four-time MAC West Player of the Week honoree has also now reached double figures in double-doubles, tallying her 10th tonight. In running an offense that held advantages in kills (48-33) and hitting percentage (.254-.164), junior setter Kristin Hoffman (Batavia, Ill./Batavia) produced a well-rounded performance: 33 assists, 12 digs, two kills on four swings. The double-double was Hoffman’s sixth of the year. Sophomore middle blocker Mary Kurisch (La Crosse, Wis./West Salem) came up big as well, netting six kills on 10 swings with on error (.500) and compiling four blocks. 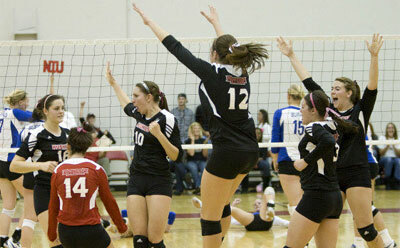 Kurisch has registered at least four blocks in five straight contests. Anchoring the defense, senior libero Maddie Hughes (St. Charles, Ill./North) dug up 12 balls, as did junior outside hitter Allison McGlaughlin (Morton, Ill./Morton). Hughes upped her consecutive double figure dig streak to 10, while McGlaughlin has done so in six straight. 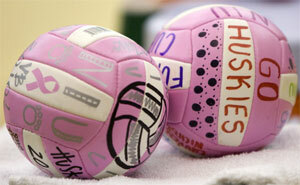 The MAC West first place Huskies trailed only two times in the match, both came early in the second and third sets. In the first set, the Huskies broke a 10-10 tie with an 8-1 run that included three kills by Wicinski. The spurt was enough to easily give NIU the set after out-killing the Bulls 16-7. In a closely contested second set, the Huskies never had a lead or more than three until late, but had control of the game, never trailing. Up 24-20, NIU nearly let the lead slide as a 4-0 fury by Buffalo knotted the game. However, the Bulls quickly cooled with consecutive errors, the first of which was a block by Romo and Angelos, to end the set. The key to taking a 2-0 lead in the match were three less Huskie errors (3) than Buffalo (6) and a hitting percentage edge of .341-.261. Next, the Huskies hit the road again, this time for their longest conference trip of the season. The four-game swing will begin with a contest at 6 p.m. Friday, Oct. 22, against Kent State (10-12, 3-4 MAC) in Kent, Ohio.